Has the heat of the summer left your skin feeling less than loved? Do you feel like you can’t drink enough water to keep your skin moisturized? Perhaps it’s time to change up your skincare routine during these harsh summer months. It is never too early to start using an anti-aging cream, especially one that can help undo the damage of harsh UV rays and crow’s feet, with the power of all natural products: plant stem cells. the MAXTM contains plant stems cells; something that not many anti-aging lines can boast. Using plant stem cells in the MAXTM products means a higher quality of skin care. It means that naturally occurring extracts help restore the balance of your skin, giving it a chance to breathe. Apple stem cell serum has been shown to protect and preserve in clinical studies. Just like the fruit that it is taken from, apple stem cells defend against dry, brittle skin and help naturally retain moisture. 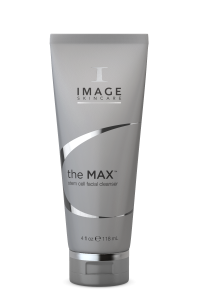 Using our daily, chemical free and gentle the MAXTM stem cell facial cleanser can help you restore your skin’s shine to its natural glow. The stem cells in all of the MAXTM products are put there to help nourish your skin from the inside out. The herbaceous alpine stem cells used in all of the MAXTM products are no joking matter. These plants (in combination with apple stem cells) keep skin hydrated and happy. Skin that is dehydrated is more prone to showing stress and signs of aging. No one is too young to start using anti-aging products! After all, crow’s feet don’t appear overnight! Our the MAXTM stem cell masque (blogged about here and available here) as part of your weekly routine can be the final step in your exclusive the MAXTM skin care regime. Imagine the healing power of plants, strengthening from within and helping smooth out fine lines and wrinkles. All of this is possible, thanks to plant stem cells! Using the stem cell masque comes with the additional benefits of forty-eight hours of invigoration from your face all the way down to your hands. Remember to apply all over since there is more to your face than just the skin on your cheekbones. Using the MAXTM products every day will help prevent against wrinkles, sun damage and dehydration. Having a routine can help fight against unsightly sun spots, and premature aging. The stem cells in the MAXTM products have been shown to help repair damaged DNA so remember to use your ‘apple a day’ to keep the dermatologist at bay. Using all of the stem cell products in combination with each other will result in the best results; however, any of our other skin care products will work just as well. Remember, your skin is only as good as the treatment you give it. Why not give your skin the best with Image Skincare.